Vita di Esopo Frigio ... Alquale di nuovo sono aggiunti le favole del medesimo Esopo, con molte altre d'alcuni elevati ingegni, ascendentia all somma di 400. 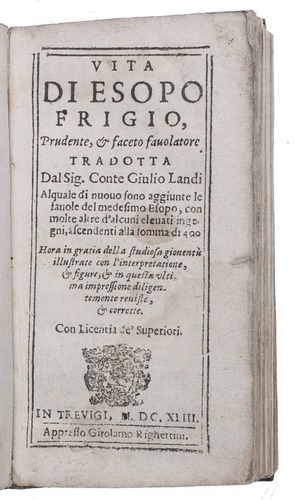 Trevigi, Girolamo Righettini, 1643. 2 parts in 1 volume. 12mo. 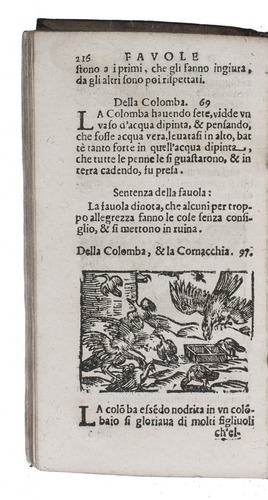 With 137 small woodcuts in text illustrating the fables, including some repeats. Contemporary sheepskin parchment. 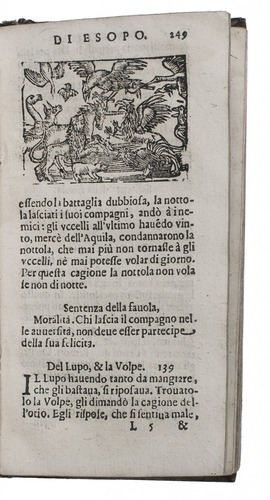 Rare edition of the Italian translation by the philosopher Giulio Landi (1498-1579) of Aesop's fables and the Life of Aesop, including no less than 400 animal fables, some collected from other sources. 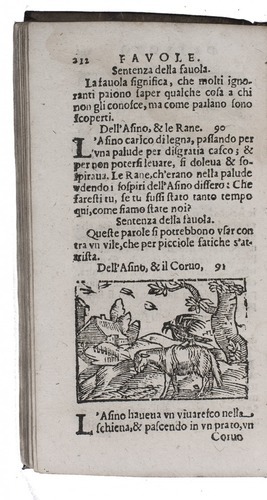 The fables are illustrated with numerous small anonymous woodcuts that appeared for the first time in 1569 in the fables collected by Cesare Pavesi and became very popular through Landi’s translations of Aesop, beginning in 1580. They have been attributed to Johann Krieger, a German working in Italy, where he was known as Giovanni Chrieger. 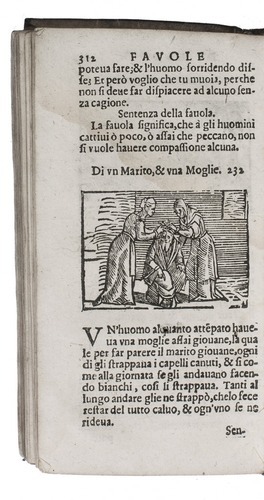 Several woodcuts are repeated, especially at the end, for the fables taken from other sources. All fables close with a moral, here called "Sentenza", intended for the instruction and amusement of the youth. With 2 holes in the last few pages, some water stains throughout, and some restorations with now discoloured tape. With the binding slightly stained, partly detached from the bookblock, and with 2 holes in the back board. WorldCat (2 copies); cf. Fabula docet 14.